The ARRL January VHF contest brings a pile of challenges for a rover. The weather is a big uncertainty. In the Pacific Northwest we rarely have debilitating snow in the lowlands (but did in 2012). Sometimes the snow prevents travels to modest elevations (3,000′). Rain and fog are more likely the issues for us. And fog mixed with near-freezing temperatures can lead to icing of antenna parts while driving. Even with these challenges, somehow I managed to eek out a rover station this year to compete in the Limited Rover class. I didn’t have the time to do too much innovation over last September. There were a few station adjustments and some tweaking of the route. The route followed the same general pattern I used last September, starting out in Ocean Shores, WA near the CN76/CN77 line on Saturday morning, and working my way to the CN85/CN95 line on the Columbia river near N. Bonneville, WA, and then to a motel in Centralia, WA for the night. Sunday’s route went from Centralia to Mowich Lake Road near Carbonado, which permits me to hit CN87 at 2,160′, CN86 at 3,000′ and CN96 at 3,100′. This was followed by a new location in the parking lot of Central Park of Sammamish, WA, which gives access to CN87 and CN97 at 700′. Then off to CN88 at a school parking lot (400′) in Lake Stevens, capped of by a trip up Mt. Pilchuck at about 3,000′. I sent my schedule out to the members of the Pacific Northwest VHF society. For the most part, I stuck to the schedule. The two major changes were that I began in CN76, moved to CN77, and then back to CN76. Also, it turns out that the CN87/CN97 spot in Sammamish was so productive that I skipped the next stop in CN97 at 1,450′ on the side of Tiger Mountain. The change helped keep me on schedule. The equipment list was quite similar to what was used for the 2014 September VHF contest. Three rigs took care of SSB and CW on the four bands a limited rover is allowed. A Kenwood TS-480 served as a 6m rig. Two meters and 432 MHz were handled by an FT-857D. And another FT-857D was used with an Elecraft XV222 transverter for 222 MHz. For FM simplex frequencies there was an Alinco 6m FM rig, an Alinco dual band (2m/440 MHz) FM rig, and a Jetstream 222 MHz FM rig. The resulting six microphones demands discipline in always hanging the rig mic on the right hook…every time. I mostly did that. One of the FT-857D heads was mounted on the dash, and the other FT-857D head and the Kenwood head were mounted on the center council using spring clamps. The system works well for my vehicle. Two rotor controls were used to turn the front and rear rotors. They were powered by a 600 watt inverter. Two RF Concepts and two TE System bricks brought power up to near the maximum allowed for a limited rover on the four SSB/CW bands. A dash-mounted cell phone provided a 24 hour clock for (paper) logging, and a second cell phone displayed my current grid. Both of these phones needed no data connection to provide these functions. One new piece of navigation equipment was a TomTom GPS. I purchased it just after Christmas and worked very hard to learn as much about it as I could. The route planning method is quite different from the previous GPS I was using. In the end, the TomTom worked out pretty well. Other pieces of equipment include a K1EL Winkeyer loaded with CW macros, a Tascam DR-1 digital recorder, a N8XJK Super Booster, a fancy homebuilt antenna switch, and a low-tech 3-position switch to move the CW paddle between rigs. Here is a peak at the back side of the rack. It’s amazing it all works. In fact, the only issue was with the power connector on the 6m amplifier, and that was minor. The rack is completely assembled, wired, and tested in my shack and then moved into the rover. Only power, external speakers, a paddle connector, a ground, remote heads, and 10 antenna connectors are attached for installation. Antennas were cleaned, refurbished, and tuned in preparation for the contest. I also did some clean-up and tuning of the two masts. The front antenna stack can be extended to 25′, but typically sits about 10′ above ground. The antenna dimensions fit within Washington state’s overhang limits so that it can be legally rotated while in motion. For some parts of the contest, like driving up Mt. Pilchuck, the mast was lowered to about 8′. The rear 6m and 432 MHz yagis were fed with LMR 400. All other directional antennas were fed with LMR-240. I arrived at Ocean Shores with about 15 minutes to the contest start, and parked in the (car) parking lot of the small airport in CN76. Antennas were set up, equipment was checked out, and I prepared log sheets for the grid. My first three contacts (6m, 2m, and 432 MHz) were with John, KF7PCL, who lives in Ocean Shores (CN76). QSOs were a bit slow after that. I kept pointing my antenna south to try and work K7NIT/R who was starting out the contest at the southern end of CN76. I found her after about 15 minutes. Within the first 15 minutes, an Ocean Shores police officer pulled up next to my truck. He was friendly and curious, and left wishing me luck. After an hour in CN76, I had worked only 25 stations. But, remarkably, 15 of the QSOs were also new multipliers. When I arrived at my planned CN77 spot, a dirt turn-around at a T in the road, there was a house being framed! Too bad…it was an excellent spot. A nearby location along a creek gave me a good pullover, but the trees kept me from extending the mast to its full height. I could have re-positioned the truck to clear the trees, but that would have consumed even more time. An hour in CN77 yielded only 21 QSOs and three new multipliers. A brief return to CN76 filled in a few missing QSOs, and I was on my way out of town. I take a small detour leaving Ocean Shores to pass through CN87 and CN86 so that I can work John, KF7PCL, in each grid on three bands (for a total of 12 QSOs). My unfamiliarity with the new GPS combined with being rusty logging while driving caused me to pull over for the last set of QSOs. I ended up about 15 minutes behind schedule. From that CN87/CN86 spot, it is about 1:45 until my next stop. In the process, I pass through CN86 into CN87 and back into CN86. For the first 30 minutes I worked zero stations. But then things picked up and I made 23 QSOs and three new multipliers before arriving at my stop. While whizzing southbound on I-5, I worked all four bands with WA7BBJ/R who was about 10 mile ahead of me in I-5. This was unplanned. Once set up in CN86, I immediatelly worked WA7BBJ/R again, this time he had crossed into CN85. In all 38 QSOs and 10 new multipliers came from this location. By the time I got set up 5 miles to the south, in CN85, I was 25 minutes behind schedule. The new location did not disappoint, and I quickly worked 42 stations. My last QSO was with KF7PCL back in CN76. By the time I left, I was only 12 minutes behind, with a 70 minute drive to N. Bonneville. A handful of en route QSOs contributed to the log. The CN85–CN95 border on the Columbia River is tucked away in a gorge. For the most part, only Portland stations can be worked from there, as signals are almost entirely blocked in the direction of Seattle (as the map shows). A state highway follows the river on the Washington side, and I-84 follows the river on the Oregon side. I had a good reason to not be late to CN95. The reason was that Rachel, K7NIT/R (along with her driver, Etienne, K7ATN) was scheduled to be on the Oregon side of the Columbia River, while I was heading Eastbound on the Washington side of the Columbia River. We decided to do a cross-river grid dance. I was supposed to arrive at 4:50, but turned up about 10 minutes late. Rachel was in CN95 and that gave us time to work the four lower bands. They moved into CN85 and we worked four more time. By that time, I hit CN95 and we worked again, and then they returned to CN95 for four more. The whole thing took 35 minutes, including some additional QSOs with K7YDL. It was awesome getting four bands worth of multipliers from CN95! That was a first. Another 10 minutes of calling CQ produced only a couple of stations, before departing for an almost 2 hour trip to a motel in Centralia, WA. I only made one new QSO during this leg. The alarm woke me after five hours of sleep. Thirty minutes later, I was on the move to Mowich Lake road and CN96. 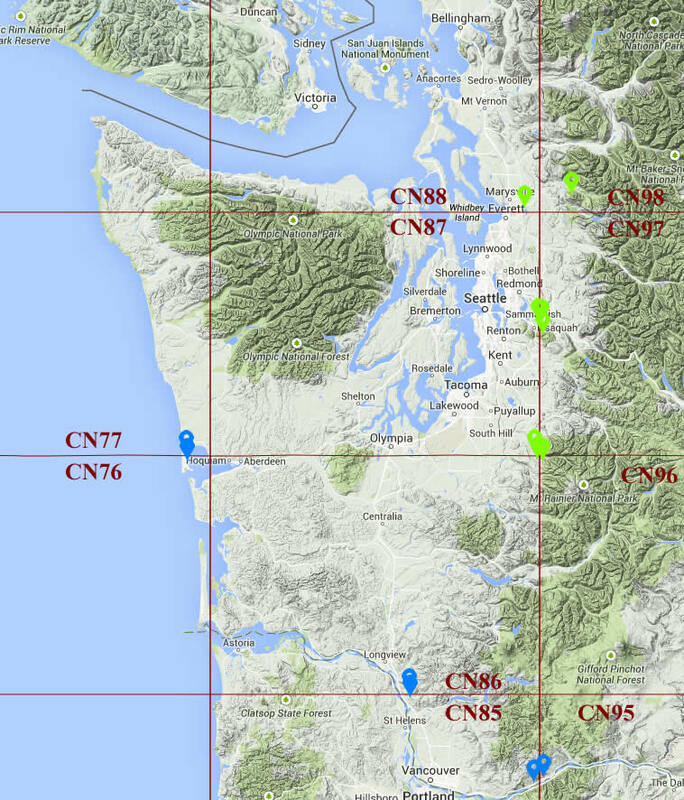 First I had about 90 minutes of travel (mostly) through CN87…that provided 13 new QSOs. Then there was 20 minutes of travel through CN86 from about 2,200′ to 3,200′. Even though I had spent many hours in CN86 already, this brief trip through CN86 provided another 6 QSOs. I arrived at CN96 about 2 minutes late and stayed for 95 minutes (instead of the scheduled 90), providing 51 QSOs. Back to CN86 for a (planned) 45 minute stay, I worked 27 stations (four of these were dups). By the time I hit CN87 again, I was 10 minutes behind schedule. Leaving this grid intersection, I had a 95 minute trip that took me between CN87 and CN97 multiple times. The trip was remarkably productive, netting something like 35 QSOs. The end point was a park in Sammamish, WA that had a long parking lot with a rotary at each end. The grid line passed through the eastern quarter of the lot. Barry, K7BWH/R, and Rod, WE7X/R had suggested we meet in this parking lot to do a small, 3 band, FM only, grid dance. I was a couple of minutes late, but we worked each other, and a handful of other stations on FM simplex frequencies on 2m, 222 MHz and 432 MHz. I set up my antennas in both grids and worked what remained, primarily to the north. The Canadian community pitched in some new multipliers: VA7FC (CN79 on 6m and 2m), VE7DAY (CO70 on 2m), and VE7XF (CN89 on 6m). A bit later, the rovers added even more multipliers. Dave, KA7RRA/R, on Mt. Pilchuck provided CN98 on 6m. Steve, KE7IHG/R, was in Ocean Shores in CN76, where we worked on 223.5 MHz FM. He then moved to CN77 and worked me on 4 bands, for 4 new multipliers–432 MHz was tough, but doable. The final new multiplier of the contest was KE7IHG/R on 6m from CN77. WA7BBJ/R worked me on 4 bands while he was in CN97 and then, again, when he hit CN87. No new multipliers, but lots of points. Man…what an incredible spot! In fact, I overstayed my schedule, and skipped doing more CN97 from Tiger Mountain. That spot might have had some good coverage into Portland, but it would have put me too far behind. The next stop was an elementary school in Lake Stevens. I made good time getting there and started but five minutes after the scheduled time. The 90 minute stay (plus a few QSOs while in motion) gave 48 QSOs. 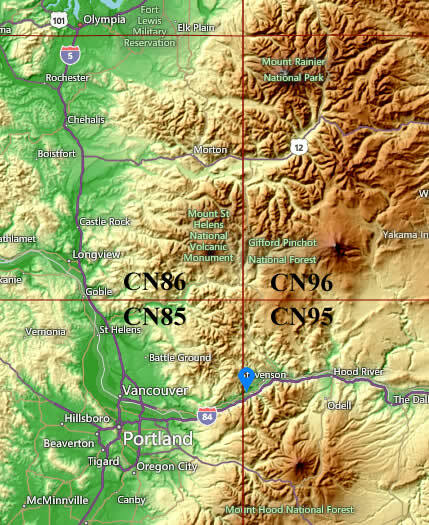 The last grid was CN98, about 3,000′ on the side of Mt. Pilchuck, with excellent reach north, west, and south. I lowered the front mast before the ascent. The (mostly) gravel road comes with plenty of overhead clearance for antennas, but some nasty potholes require deviations to the edges of the road where branches hang lower. For once, I hit the airwaves ahead of schedule—by one minute—leaving 91 minutes to the end of the contest. There was a burst of activity at the end, as I made 65 QSO, including two with AC7MX that went right down to the end. Oh…I almost forgot to mention the weather. It was warm all weekend, and Sunday was sunny. At the end of the contest, skies were reasonably clear at an altitude of 3,000′, but there was dense fog in the lowlands that extended my 90 minute trip home by about 10 minutes. On the trip home, all the radios were turned off, except the one tuned to the public radio station blaring the blues. VE7AFZ/R was in CN99 when I worked him from CN76 about 35 minutes into the contest. I pointed out that I had never even worked CN99 before. He replied that he had never worked CN76 before (HA!). We worked again, a short while later, when I got to CN77. The other notable thing was the number of active Canadian stations. In addition to VE7JH/R and VE7AFZ/R, VE7DAY, VA7FC, and VE7XF provided unique (or rare) multipliers. The result was QSOs in CN78 and CN89 on 4 bands, and CN79 and CO70 on two bands. The score shows a nice improvement from the 2014 ARRL January VHF Contest. The number of QSOs increased slightly from 492, a gain of +30. Total points increased slightly by +43 from 644. The big difference was in the number of grids worked, which increased +18 from 37. Last year, I closed my January post by suggesting it would be very difficult to score over 35,000 in the absence of sporadic E openings for this contest. Clearly, I was wrong. But the credit really goes to the increased activity, particularly on the part of other rovers. I’ve long maintained that more rovers translate into more fun for these contests. That certainly was the case this year.